Land rights were one of the election’s central issues. Many consider declared victor Juan Orlando Hernández a puppet for transnational extraction companies. In 2009, a U.S.-backed coup d’état ousted Honduras’ center-left president Manuel “Mel” Zelaya, creating a climate of instability that led to skyrocketing crime, unemployment and increased economic inequality. Honduras’ two main cities, San Pedro Sula and Tegucigalpa, now have some of the highest assassination rates in the world, which spreads intense feelings of insecurity among the residents. Hernández easily manipulated these fears during the campaign. 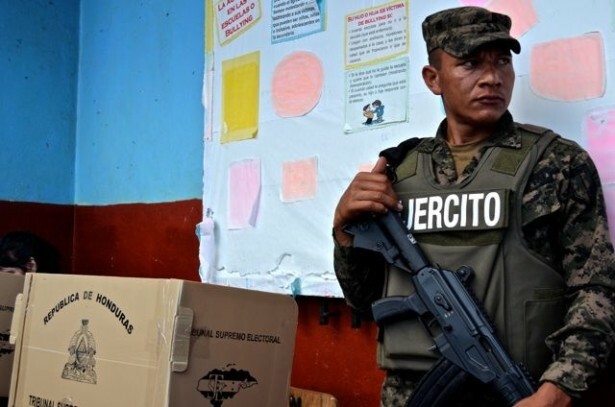 The current president, Porfirio Lobo, who assumed office after the 2009 coup through an illegitimate election, has also pushed militarization. Promising safe and intimidation-free elections, his administration deployed 30,000 soldiers across the country for the November 24 election day. The election and its outcome is part of a greater trend in Honduran politics that divide the nation from its neighbors. While many Latin American nations have moved left in the last decade, Honduras has swung sharply to the right. During his four-year presidency, Lobo has opened the floodgates for transnational investment, including resource extraction projects that threaten the indigenous communities living in resource-rich territories. Hernández has promised more of the same. All this has made the former Banana Republic a 21st century playground for Chinese companies that want to build hydroelectric projects, Canadian companies that want to build mines and U.S. corporations, such as fast food chains, that want to corner consumer spending in Honduras. Last month’s elections could have disrupted Honduras’ shift towards militarism and increased corporatism. Candidate Xiomara Castro, the wife of ousted president Zelaya, ran as the leader of the newly formed LIBRE party, which emerged as part of the resistance movement after the coup. Castro ran on a platform of creating community police forces and sending the soldiers back to the barracks. While she didn’t promise to end transnational investment or resource exploitation, she did pose a threat to imperialism. Official reports issued by the Organization of American States and the European Union have applauded the 2013 Honduran elections as fair and clean. But many Hondurans experienced anything but a safe and fair process. A month before the elections, 50 and 60 heavily armed military police officers raided the home of community activist Edwin Espinal, who has been active in the post-coup resistance movement and is no stranger to police repression. He has been arbitrarily detained and tortured so many times that international human rights bodies have recommended precautionary measures for him. His girlfriend Wendy Díaz died in 2009 from an asthma attack provoked by massive amounts of tear gas used in the post-coup protests. “The police and soldiers have not stopped intimidating me and prosecuting me and every member of my family since the coup in 2009 because I am a member of the National Resistance Front,” Espinal said. The repression that Espinal has suffered is far from isolated. A Rights Action Report documented the assassination of 18 members of the LIBRE Party in the lead up to the elections. The night before the elections, two more party members were gunned down in a rural community outside of the capital. When Hernández was declared the prospective winner Sunday night, a tense calm descended on the capital of Tegucigalpa. Hooded military police stood guard in front of gas stations, businesses and other key locations in anticipation of a street rebellion, although few took to the streets. Military officers surrounded the offices of Radio Globo, a popular station that broadcasts opposition voices. The following day, Manuel Zelaya, speaking on behalf of his wife, Xiomara Castro, declared that she wouldn’t accept the results, stating that LIBRE was the true winner of the elections. Although he encouraged people to stay calm, thousands of students at the Autonomous University in Tegucigalpa protested in front of their university. They were met with riot police, who attacked the students with a water cannon and tear gas. One student, who asked to remain anonymous, spoke out against Hernández. “He will make our lives more difficult, raising the price of basic goods, gas and education. He’ll want to privatize the universities,” he said. Land rights were one of the election’s central issues, and many see Hernández as a mere puppet for transnational energy and extraction corporations. Shortly after the coup, sitting president Porfirio Lobo passed a package of laws that paved the way for the privatization of the rivers and opened up concessions for over 40 hydroelectric projects, many of which threaten to displace indigenous and rural communities. The community of Rio Blanco’s struggle against a hydroelectric project in northwestern Honduras has become emblematic of the land battles in post-coup Honduras. Residents in the community have erected a road blockade to prevent the entrance of the Chinese company SYNOHYDRO, which is attempting to construct a dam on communal farming land. 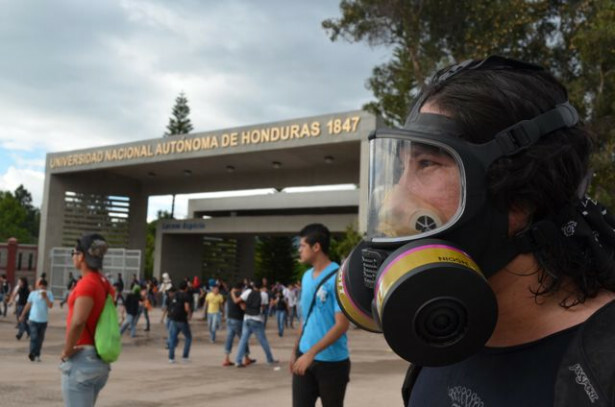 The government had deployed Honduran soldiers to guard the company’s headquarters. Over the summer, one soldier opened fire on a protest, killing community resident Tomás Garcia, critically injuring his teenage son and wounding two others. Bertha Cáceres, the national coordinator of the Civic Council of Popular and Indigenous Organizations, which has lent support to the road blockade, explained that the dam will never be built without the government’s increased militarization of the region. “No extractive project can be implemented without the backing of soldiers because the [projects] are against the well-being of the communities, which in turn rise up in defense of their livelihood and fight these projects of death,” she said. International observers agreed that the election – and Hernández’ platform of militarization – is ultimately about natural resources. The United States has long had its hand in Honduran politics. In the 1980s, the United States constructed the Soto Cano air base in Honduras as part of the counter-insurgency efforts against the Sandinistas in Nicaragua and the FMLN in El Salvador, both Marxist guerrilla movements that opposed U.S. imperialism. Prior to the 2009 coup, former president Zelaya planned on converting the base into a commercial airport. Post-coup, it has served as an essential base for U.S. drug war operations. The United States has recently increased its aid to Honduras and is currently building three new army bases. Meanwhile, the infamous Georgia-based School of the Americas, now rebranded as the Western Hemisphere Institute for Security Cooperation, continues to train Honduran soldiers. Azadeh Shahshahani, president of the National Lawyers Guild, said that on her way to Honduras to observe the elections, she saw Honduran soldiers returning from the School of the Americas training base in Fort Benning, Ga.
“They were just coming back to Honduras where there is impunity for murder, for all kinds of human rights violations,” Shahshahani said. She also commented that, in training Honduran soldiers, the United States is in violation of its own law, which prohibits U.S. aid to military units that have committed gross violations of human rights. In the weeks since the election, thousands of people have begun to mobilize to denounce the fraud and declare a recount. The government has said they will conduct a recount of the final tallies that came in from the polls, although it won’t recount the actual votes from the stations. Considering that many people believe that the fraud was committed in the voting stations, few have faith that a recount of the tallies will change the results. Meanwhile, many are increasingly worried that when Hernández takes office, the country will experience further repression of social movements and the increased pillage of indigenous communities’ land and resources by transnational companies backed with military force.